With this mode you will be able control time and travel from one time period to another. 1. For time control, you have to be crafted or get using TMI improved clock (Advanced Clock). 2. Now, to take advantage of the clock, take them over, click anywhere and open a special menu. 3. You can by clicking Set time to night or Set time to day control the time of day. But most importantly, if you move the slider to Time Speed Wravien, the world will accelerate, and if left, will slow down! 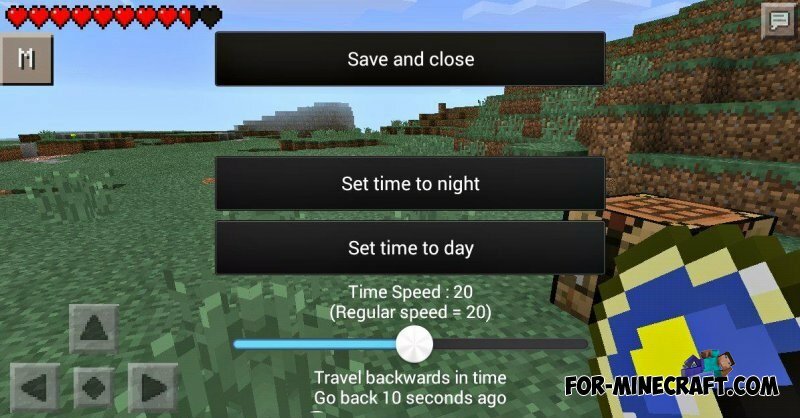 SuperGamer mod for Minecraft PE 0.10.5This mod will help you become a super player in the game Minecraft. With this mode, you can quickly restore your health, will be able to squat, can control the time and much more.